At the end of December, ADAPT’s Afterschool and Saturday Recreation programs came together to celebrate the holidays. The day started with the individuals creating holiday-themed arts and crafts, including Santa hats and Christmas ornaments made out of wood. Everyone who participated was in great spirits and had a wonderful time! The Afterschool program participants celebrated the event with light snacks including brownies, cakes and cookies. The Saturday Recreation programs participants in Brooklyn, Manhattan and Staten Island feasted on a holiday lunch, which included chicken, mashed potatoes, baked macaroni and cheese, fish, salad and quinoa. 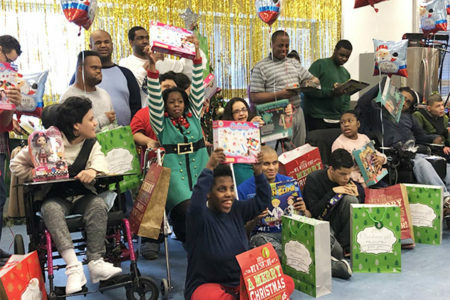 The attendees from both the Afterschool and Recreation programs went home with holiday gifts, donated by Frank Davi from the Executive Color Systems.